If you thought touring in a van in Canada was a challenge, try doing it in a canoe. Toronto songwriter Peirson Ross is making it happen, having embarked on a 900 km North Eastern canoe tour from Georgian Bay to Montreal with filmmaker/adventurer Frank Wolf. 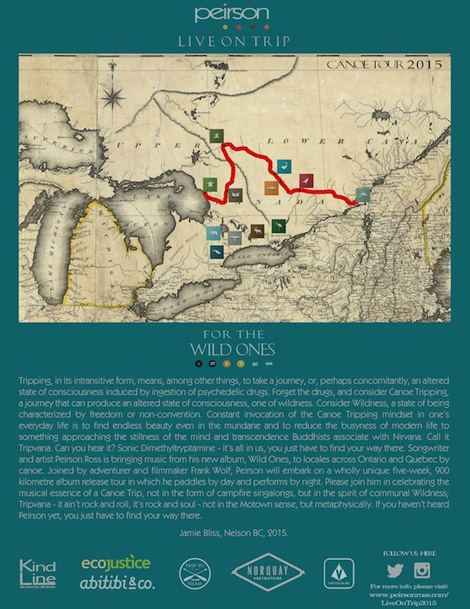 The tour is to celebrate the release of Peirson’s latest album Wild Ones (stream) and to pay homage to the very essence of Canada – the wilderness. Like modern day Voyageurs, Peirson and Frank are travelling by canoe on the same water veins as the First Nations did when they populated the lands 10,000 years ago. 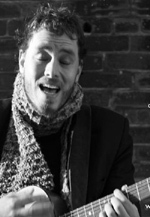 Ross describes Wild Ones as a homesick project that prompted him to reconnect with his roots. Written in his New York apartment, Peirson plays each of the 20+ instruments, also designing and creating the beautiful artwork. Each tile on the cover holds a paper-cut image of one of sixteen endangered species of Canada, and along with the songs, he intends for them to “represent the ten provinces, three territories and three oceans that reside within these fragile habitats.” Peirson’s aim was to marry “art, music, and nature in an album dedicated to wildlife and to those living the wild life.” This is for the wild ones. Stay tuned here for updates and track the tour here. Here’s one of my favourites from the album, “No Other Way”. Well, there isn’t snow on the ground just yet in Toronto, but you could see flakes flying around in the wind this morning. With the snow comes the realization that we’re now in December and on the edge of the imminent holidays. I’ve resisted posting Christmas-y songs on the blog up until now (as I’ve received a ton of them through e-mail), but perhaps I’m finally getting in the mood. I came across this song “Snow On The Ground” by Toronto/NYC artist Peirson Ross while going through songs on his website. The video features his song soundtracked to that final scene in “It’s A Wonderful Life”, a movie you might end up watching this month. Seems to work pretty well, nice music supervision job done there. 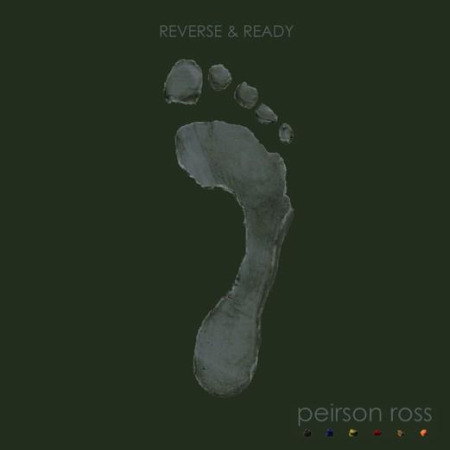 I’ve been enjoying catching up here on email and spending some time listening to the newest digital EP from Peirson Ross called Reverse & Ready (Sept 29th, iTunes). I’m guessing the album name comes from a Lifeguarding technique I remember learning when I was training to become a Lifeguard back in highshool. Its a way of approaching a drowning swimmer in the water, foot first. That way, you can use your foot to push a flotation device to the person drowning, or using your foot as a way of protecting yourself from the swimmer if they panic and try to pull you under the water. Helping someone while keeping yourself safe in case they turn on you. The six song EP haunts with soulful harmonies and guitar picking backed by deep strings and cellos. And for anyone who saw the movie Away We Go and fell in love with Alexi Murdoch‘s voice from that film, you’re probably going to love Peirson’s similar delivery. Try out Mend. Catch him live in TO and NY below. Simone by Peirson Ross. Take a listen, really beautiful tune.